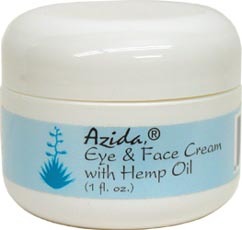 A fragrance-free, hemp oil-based moisturizing cream that is gentle enough for the delicate skin around your eyes. With aloe, evening primrose oil, comfrey, and eyebright to tone, nourish, and keep your skin looking younger. 1 oz. jar is $6.99. Ingredients: Purified Water, Aloe Vera Gel, Extracts of Eyebright, Goldenseal, Witchhazel and Carrot Seed, Sodium Hyaluronate (natural moisturizer), Stearic Acid (from Vegetable Oil), Vegetable Glycerin, Hemp Seed Oil, Dexapanthenol (Vitamin B5), Glyceryl Stearate (from Vegetable Oil), Vitamin E Acetate, Sodium PCA, Dimethicone, Borage Oil, Oil of Evening Primrose, Allantoin (from Comfrey Root), Sorbic and Benzoic Acids (Fruit Acids), Grapefruit Seed Extract and Carrot Oil. From NG Sau Han of Hong Kong, Hong Kong on 8/24/2014 . I have a very sensitive skin but this product doesn't irritate my skin. I like its texture too. From LC of Bellingham, Washington on 1/15/2013 . I am a 60 yr old vegan. I found this to go on rather sticky and it remains a bit sticky for some time. It is ok, but I am looking for something that soaks in, isn't sticky and that you still know is on your face later in the day. I have been hooked on Origins, but really wanted to find a vegan moisturizer to replace this brand. From Leila of Philadelphia, Pennsylvania on 1/5/2011 . This is expensive for such a small container, but the product is great for sensitive skin. It has really reduced irritation that I had been experiencing from scented moisturizers. From Anastasia of Tallinn, Estonia on 8/5/2009 . It is light and smooth, just the right texture for delicate skin. it absorbs very well and you only need a tiny bit of it each time. the best part is that, unlike most creams, it doesn't leave the skin greasy or shiny. my face likes it! From CM of Bellingham, Washington on 11/19/2008 . I was a bit disappointed, but I have very dry skin and I am in my 30s, so I am looking for something with a little more power. I agree it felt good on my skin at first, but it did not seem to have a lasting effect--within 20 minutes my skin was just as dry as before. I am looking for something with more sustainable moisturizing properties.